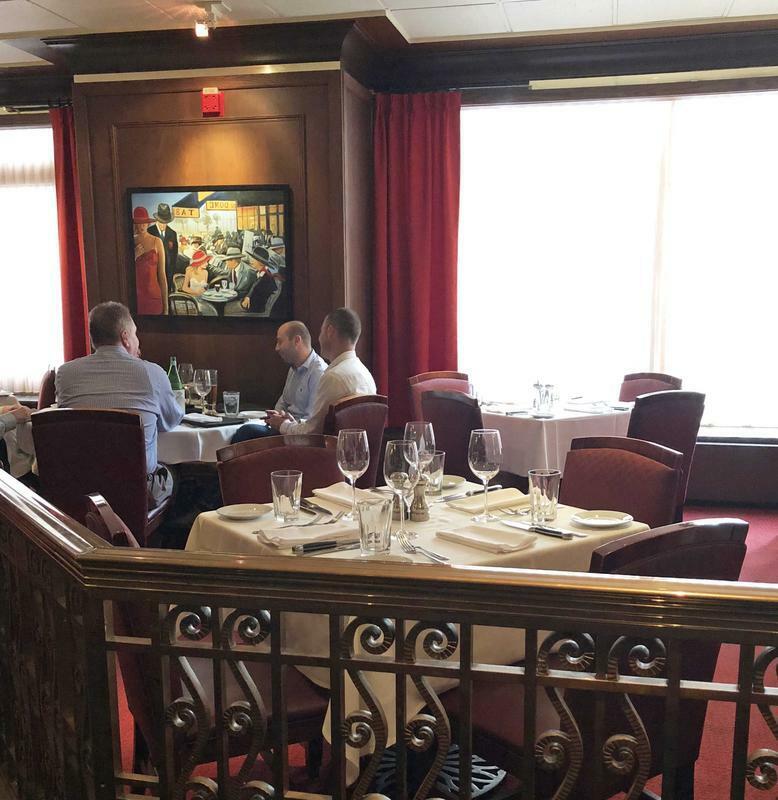 My travels take me to the downtown Cleveland location most often, and I really enjoy as well as appreciate its quiet and well-appointed dining room. The staff is very attentive to every detail of your culinary experience, whether in the bar or the main dining area. Click Here to View the Hyde Park Steakhouse Menus! On a recent visit, my partner and I started with the Modern Chop Salad. Although there are a variety of excellent salad choices on the menu, the Modern Chop Salad is very tasty and could probably serve as a full meal all on its own. 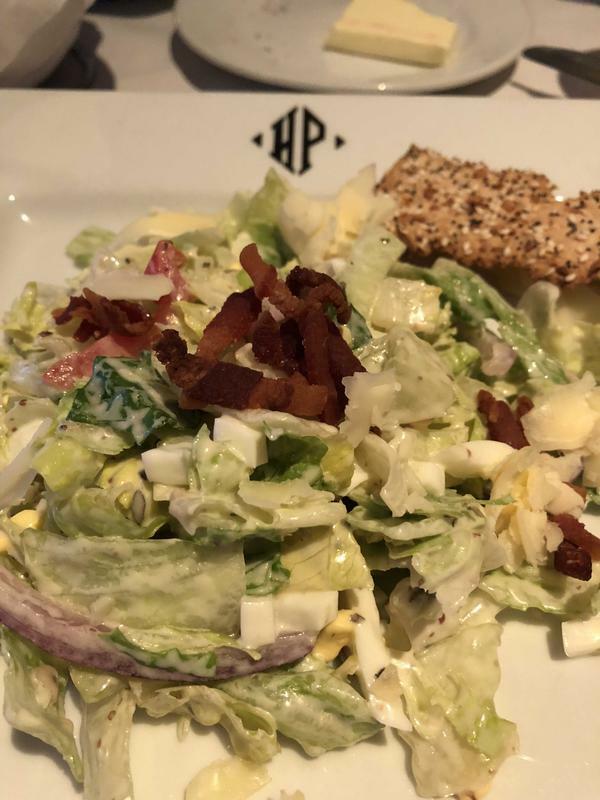 Blending crispy pancetta, hard-boiled egg, julienned English cucumber, tomato, red onion, celery, house vinaigrette and aged white cheddar, everything about this salad is absolutely delicious and serves as my usual choice for the start of any meal at Hyde Park Prime Steakhouse. For dinner, my partner selected the Ahi Tuna Tower from the appetizer menu. She’s a big fan of seared Ahi Tuna and can be a tough judge of any attempts at this dish. As expected, the Hyde Park preparation got a quick two thumbs up and dinner was underway! The Ahi Tuna Tower featured avocado, wasabi soy lime dressing and wontons. A perfect combination of flavor and texture! She ate every bite. I chose my usual Hyde Park favorite, the Steak Brown. 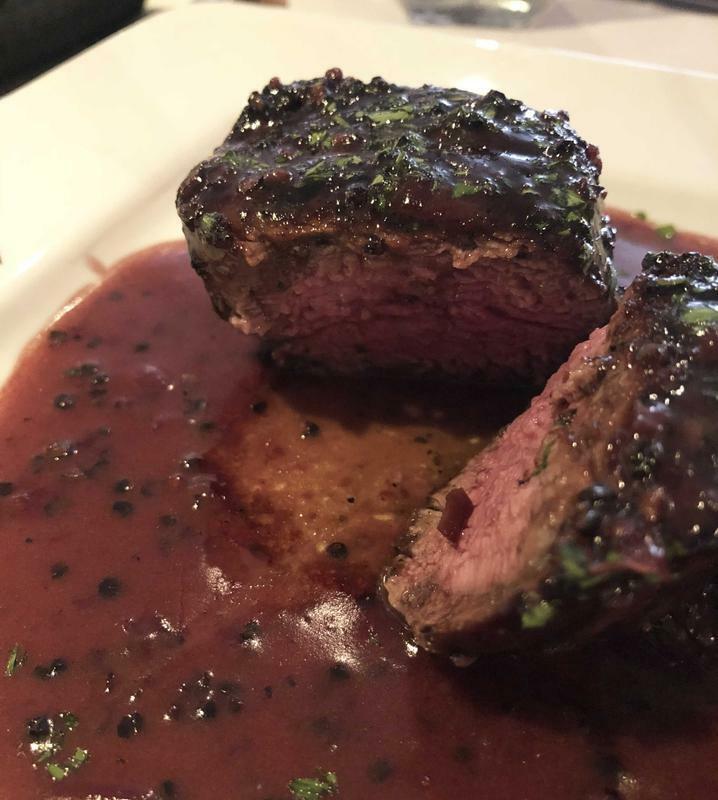 This filet was cooked perfectly and tender, as always. I’m a fan of peppercorn seasoned steaks and the combination of garlic with cracked black pepper in a roasted shallot Cabernet sauce is truly divine. For sides, there is something for everyone and you really can’t miss! My favorites are the Potatoes Gruyere Gratin and the Sautéed Spinach and Mushrooms. However, the Lobster Mashed potatoes, Roasted Brussels Sprouts and Asparagus sautéed in E.V.O.O. and Parmesan will not disappoint. 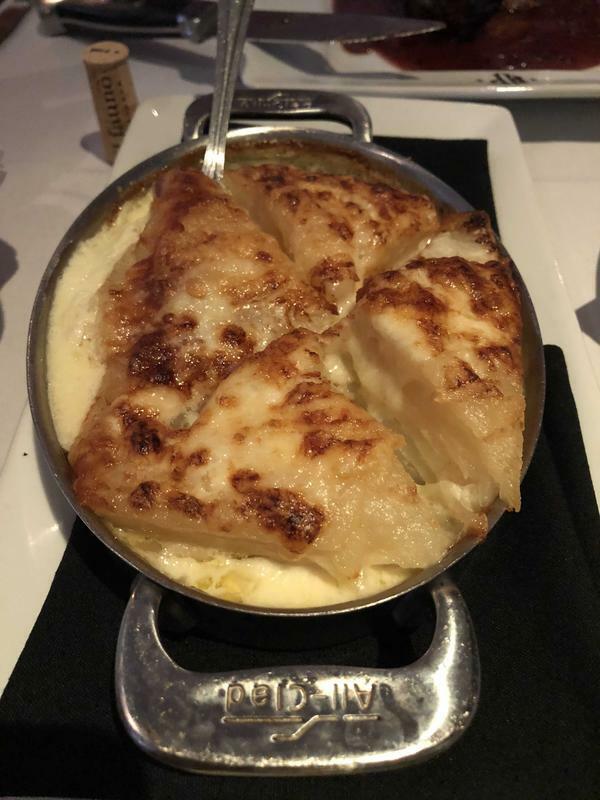 Hyde Park Prime Steakhouse also names several of their steak preparations after famous Cleveland sports figures and you’ll find LeBron James, Terry Francona, and Bernie Kosar represented well. Japanese Wagyu beef is also on the menu. I always look forward to a visit to Hyde Park Prime Steakhouse and it always lives up to my expectations. I really can’t think of a more relaxing and rewarding way to wind down after a hard day (or week’s) work! With that comment, I must add that Hyde Park Prime Steakhouse has one of the area’s best wine lists in Cleveland, too. Click Here to Make Reservations at Hyde Park Prime Steakhouse in Cleveland!